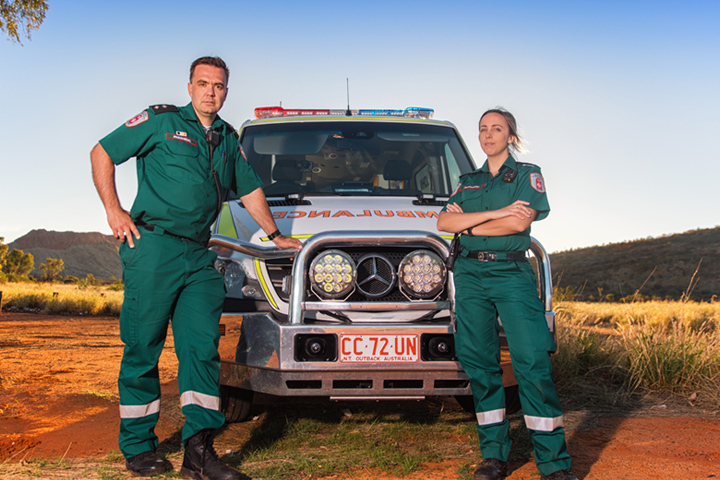 Paramedic Reece Ravlich was honoured this month in the Governor General’s Bravery Awards. In 2012 Reece and his partner were confronted by a man armed with a knife while treating a patient in Nhulunbuy. Reece managed to disarm the man of the knife and lock himself, his partner and their patient in the ambulance. Paramedics regularly place themselves in high risk situations to save the lives of those they are called to treat, this Bravery Award is recognition not just for Reece but for all those who protect the community. This month in Flashing Lights I would like to showcase our Community Education Team, Hayley, Jo, Reggie and Tamar. This dedicated team undertakes an essential piece of work in St John’s mission of making First Aid a part of everyone’s life. The St John First Aid in Schools Program is designed to educate children on how to assist in emergencies and provide them with first aid skills. Thanks to the generous assistance of the Nhulunbuy Rotary Club our St John First Aid in Schools Outreach Program managed to train over 400 school children in first aid skills in Nhulunbuy in August. Reaching large number of students like this is important but equally as important is reaching small numbers of children in isolated and remote communities where professional medical care might take quite some time to reach them. This St John First Aid in Schools program, with the generous help from organisations like Rotary, benefits not only the children but the wider community as these children now have the confidence and skills to save a life. The Community Education Team have also partnered with Bits4Bub at Coolalinga to deliver baby CPR sessions for parents to instil in them CPR skills should the unfortunate ever happen. The first session was held in August with over 90 parents and their babies in attendance. We recently welcomed eight new paramedic interns in August to Ambulance Services. The interns, who have recently graduated university with a Degree in Paramedicine, will undertake a period of induction in Darwin before they take up their internship positions across the Northern Territory. We welcome the new interns to what is sure to be an exciting start to their new careers. St John Ambulance crews at this year’s Garma Festival in East Arnhem Land received the best thank you when a group of young locals volunteered to wash the ambulance. The annual Garma draws people from all over the world to the Gulkala site near Nhulunbuy – and once again St John Ambulance provided medical cover for the event. In early August St John Ambulance volunteers provided First Aid cover at the exercise Pitch Black Open Day at RAAF Base Darwin. The biennial three-week multi-national exercise Pitch Black is the Royal Australian Air Force’s largest international air defence exercise, and thousands of aviation enthusiasts gathered at the Open Day to get up close and personal to a variety of Australian and international aircraft. Only days after Australia’s population hit 25 million people, a baby boy has become the latest addition to the country’s population, when he was born just before 3am on August 10 in the back of an ambulance in remote East Arnhem Land. With the help of the paramedics the young woman gave birth to a baby boy in the back of the ambulance. Both mum and baby were taken to Gove District Hospital. Higher-than-anticipated birth rates and mass migration have seen the country’s population increase to 25 million earlier this week - 33 years earlier than predicted two decades ago. A little boy was taken to hospital in early August after falling down a 1.5m deep hole in Wanguri. St John Ambulance paramedics, police and fire crews were alerted to the 5-year-old’s plight just before 5pm. The boy was stuck in the narrow hole by his legs and earth moving equipment was requested to free him. But first responders were able to extricate the boy from the hole prior to earth moving equipment arriving on scene. He was taken to Royal Darwin Hospital for precaution. Only days after a toddler burnt himself with boiling water, another little boy was taken to RDH in August with similar injuries. The 20-month-old, from Gunn, had accidentally poured a cup of hot tea over himself, burning his chest and left arm. His parents administered first aid and cooled the wounds while St John Ambulance paramedics were en route. The boy was taken to Royal Darwin Hospital in a stable condition. Earlier in the month, a 20-month-old boy was taken to RDH from his home in Coconut Grove after he pulled a container with boiling water off a bench onto his chest and neck. St John Ambulance intensive care paramedics Mark Ferguson said it was crucial to administer burns first aid at home prior to the arrival of paramedics. “If anyone gets burnt, remember to cool the wound under cold water for 20 minutes and seek medical aid,” Mr Ferguson said. St John Ambulance paramedic Reece Ravlich protected his patient and a colleague when threatened by a man wth a knife in Nhulunbuy in 2012. For his brave conduct he recevied a Governor-General’s brave conduct commendation. 18 Australians received a Bravery Medal, with 40 commendations for brave conduct, three group bravery citations, and one star of courage awarded by the Governor-General. They selflessly put themselves in jeopardy to protect the lives or property of others. Bravery or courage differs from fortitude in a crisis situation. Bravery is a deliberate choice to go from a place of safety to danger or remain in a perilous position to provide help. "These awards have drawn national attention to the personal efforts of individuals, made willingly, without thought of personal risk," Governor-General of Australia, Peter Cosgrove, said. "On behalf of all Australians, I thank them for their bravery. They are a source of courage, support and inspiration, and we are a stronger, safer and more caring nation because of them." Queensland Ambulance Advanced Life Support Paramedic Mark came to share information with our St John Ambulance crews at Casuarina in August, following Mark’s Black Dog ride from Brisbane to Darwin. Over 300 riders took part in the ride. Winston, the little black dog, was presented to St John Ambulance as a gift. He is named after Winston Churchill who had depression and penned the term “black dog”. Mark said he believes Winston would be a great conversation starter about depression and the effects it has. In August St John Ambulance crews in Alice Springs joined forces with our colleagues at the Northern Territory Fire Service and the Alice Springs Hospital Retrieval Service in a multiagency mass casualty incident and extrication management exercise. The aim of the day was to develop and refine theoretical and practical application of mass casualty incident management and extrication techniques with both a tabletop and field exercise completed. These types of interagency training days are vital in ensuring pre-hospital and emergency responders maintain the skills and working relationships which are imperative to ensuring safe and effective management of real life critical incidents. This translates to patients and the entire community receiving the best possible care in a pre-hospital environment. Less than two hours after opening its doors, St John Ambulance Patient Transport Services crews delivered their first patient to the new Palmerston Regional Hospital on August 27. Just before 11.45am St John Triple-000 Emergency Medical Dispatchers tasked the Patient Transport Services crew to Noonamah to come to the aid of an unwell woman in her early 40s. The sick woman was taken to the new hospital, where she arrived in a stable condition at around 12noon. Thanks to a generous donation by Nhulunbuy Rotary Club our Community Education team was able to travel to Nhulunbuy to teach school students crucial first aid skills through our First Aid In Schools NT program. As part of the program children in primary and high school learn first aid skills ranging from checking for danger and calling an ambulance through to resuscitation, bleeding control, managing fractures and other medical emergencies such as stroke or heart attack. “The St John Ambulance NT First Aid in Schools ‘Remote Indigenous Access Project’ promotes positive, confident and informed action by young Territorians in emergency situations,” St John Ambulance CEO Judith Barker said. “The First Aid in Schools program aims to make first aid skills part of the learning outcomes for every school-aged student in the NT by delivering training specifically developed for children and young people to suit the needs of different education levels. The inaugural Baby CPR course at Bits4Bub at Coolalinga Central was a huge success with parents. Over 90 participants came along in mid-August to learn life-saving skills. All funds raised on they day went directly to our St John Ambulance volunteers. The St John Ambulance team in Nhulunbuy was presented with a cheque for $600 by the East Arnhem Blues Society Show and Shine. “We would like to thank St John for joining us on the day - your support is greatly appreciated,” Dan Wagg said. “We hope that the EABS Show and Shine will get bigger and better each year so we can donate more funds to the organisations that continue to support the community.